My turn to be WICKED for the Wicked Blog Hop! A big thank you to Mdm Samm at !Sew We Quilt! and Wendy at Why Knot? 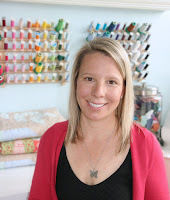 for dreaming up, organizing, and hosting this great blog hop! If you are new here? Welcome!!! 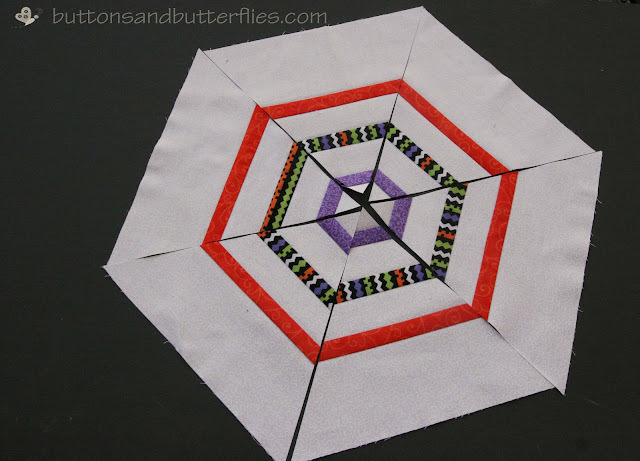 An Itsy Bitsy Spider Block for you! She measures 12.5 inches...but can be made ANY size or style you would like. I decided to showcase her on this 16 inch pillow, so I had to add a few things! 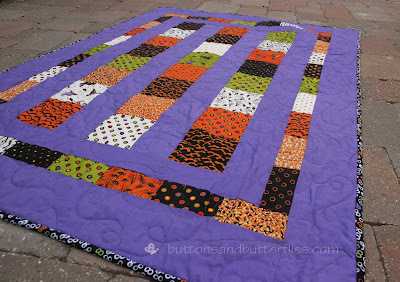 First off, I chose this block because I have been meaning to do a spin off of my Moda Bake Shop quilt tutorial. The boys are in high Wicked decorating mode! Spiders galore! Halloween has become a new family affair. but a few chairs have mentioned that they feel much neglected this year. (yes, my furniture and house talk to me). I can't stand to disappoint them, so new throw pillows!! 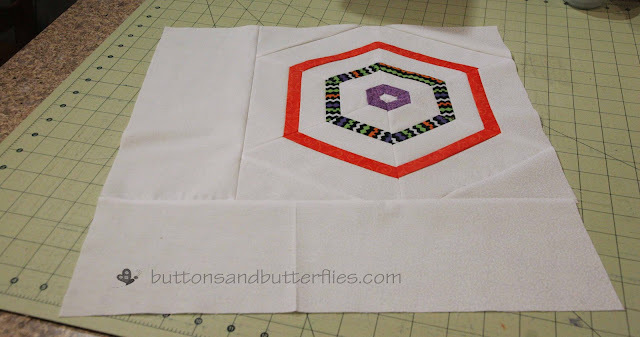 I took the block (tutorial below) and added large sashing on only two sides so it was juxtaposed in the corner. A bit of spider web quilting. 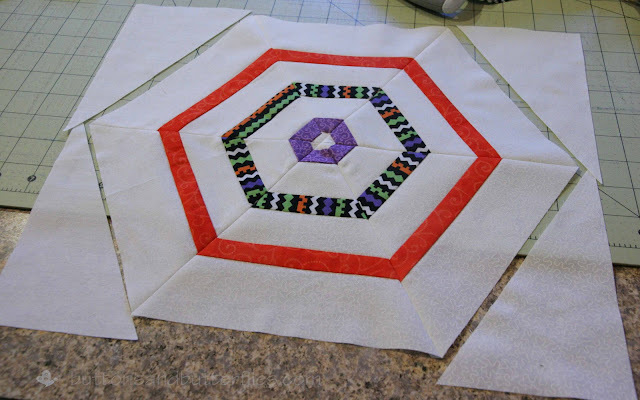 I simply stitched in the ditch, and then echoed the hexagon pattern a few times around to the edge. 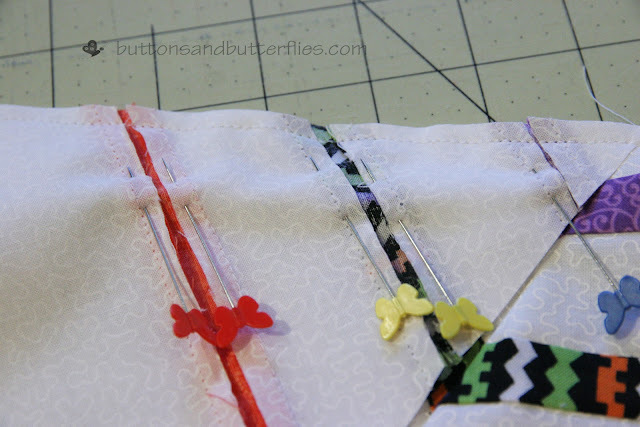 I then used the pieced seams as my guide out to the perimeter. I then added some more in between. I recommend starting in the center each time so it stays smooth in the center. And to be a wee bit wicked, a fly with button eyes, button body, and felt wings. Poor thing is trapped in the web. A cheeky spider made up of buttons and hand embroidery making an appearance to see if he might have caught his next meal. He is hanging from a double threaded back stitch. 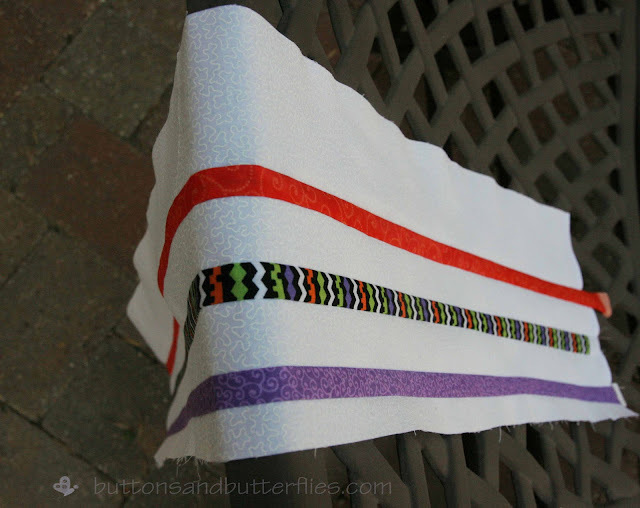 I had to pull out this fabric from my stash for the backing. And binding. It reminded me of bug eyes! 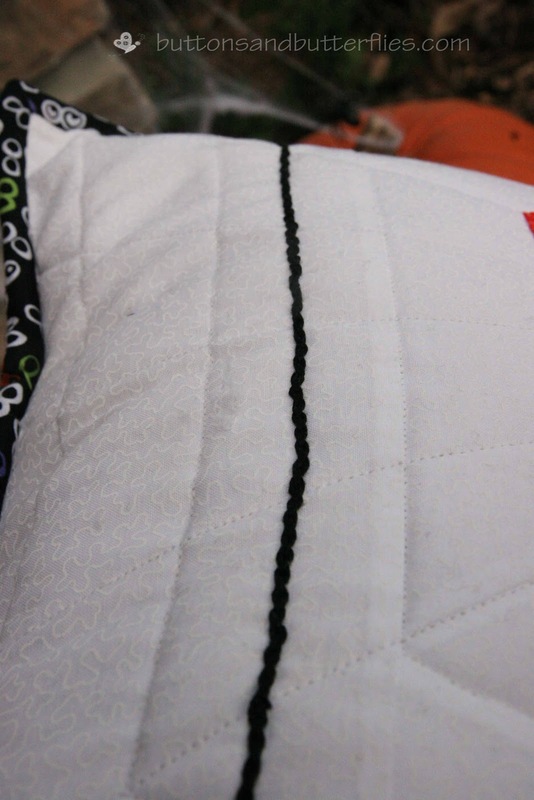 It was the first time I have ever used a binding on the edge of a pillow. I really like how it creates a combination of piping and flange. I definitely will keep this idea in my back pocket for future pillows. Why am I in love with this fabric? It made its first appearance as the binding for my Trick or Treat Charm quilt I made this month for an auction. Oh. And guess who won it? My sister! I have a sneaky feeling she was very Wicked herself to get it! 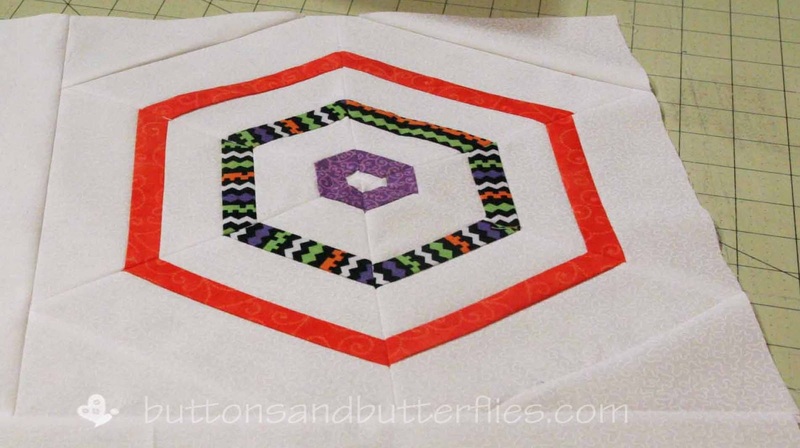 Overall, I think this block is fun and has a limitedness of potential! 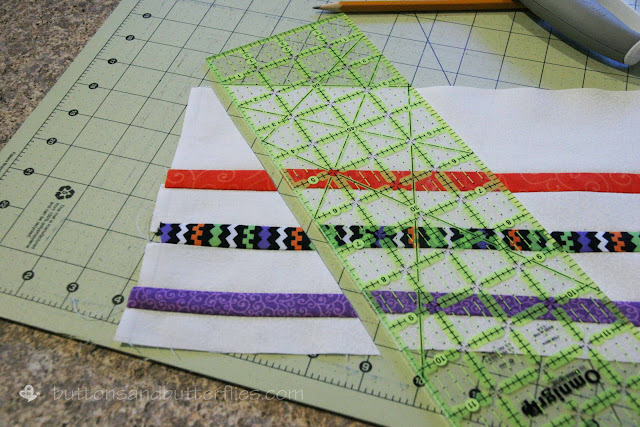 Cut several strips in various sizes, I recommend smaller ones for the "webs". I marked on the photo the sizes I used to so this particular 12.5 inch block. I cut the strips from WOF and pulled leftover strips from my long arm machine ventures. Just remember that you need to make sure the width of the long strip rectangle measures half the size of the finished block you want. In this instance, I made mine 7 inches high because I wanted to trim mine down to a 12.5 inch block. I like to have that leeway! Next check your ruler out! Many of your rulers will already have a 60 degree angle on it. Go look! You simply line the 60 degree line up with the top of your strip and cut the angles. I have a very detailed demonstration of this cut at the Moda Bake Shop tutorial. You will see that the angle is the same for any size strip. It makes a perfect equilateral triangle by turning your ruler both directions. Because I made the choice to go larger with my triangle for wiggle room, I did have to make a second shorter striped rectangle to make one more triangle! 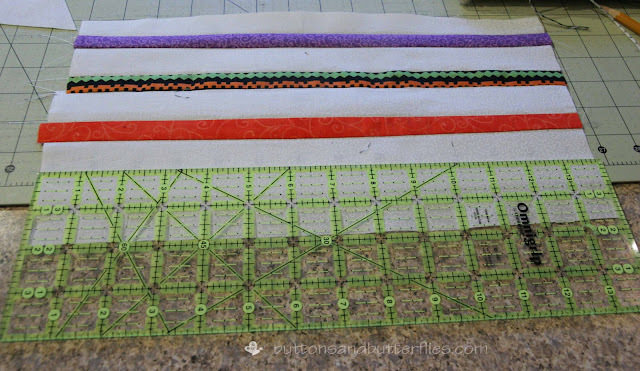 But if you plan to make an exact 12.5 inch block or smaller you should only need a pieced strip the length of your WOF (width of fabric)! Time to layout the triangles. You will have some that match in the center and some that match on the outside. For the purpose of this pillow, I used the one that had the purple toward the center. I plan saving the other triangles for some other ideas I have! Now split your hexagon in half. Piece each triangle together by making sure you match up those strings with pins. Or just be Wicked and just go for it! 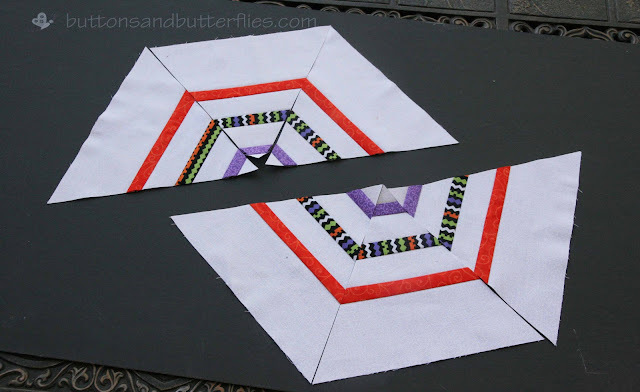 Simply piece them together and you will have a hexagon. Next cut a rectangle the height of your other stripped rectangles and double the width of that same measurement. In this case I wanted to play it safe and cut mine 7.5 inches by 14 inches. 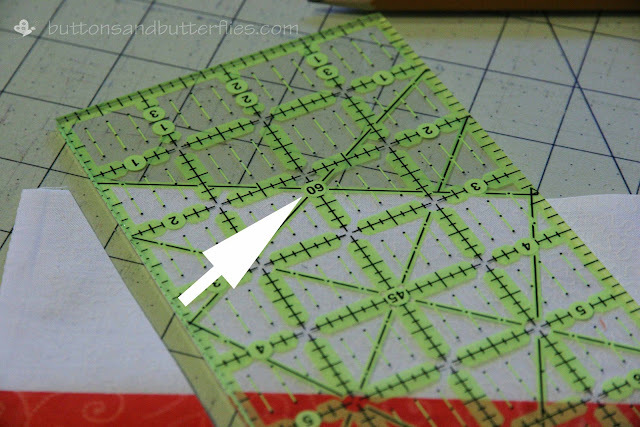 I then started cutting 60 degree angles again. 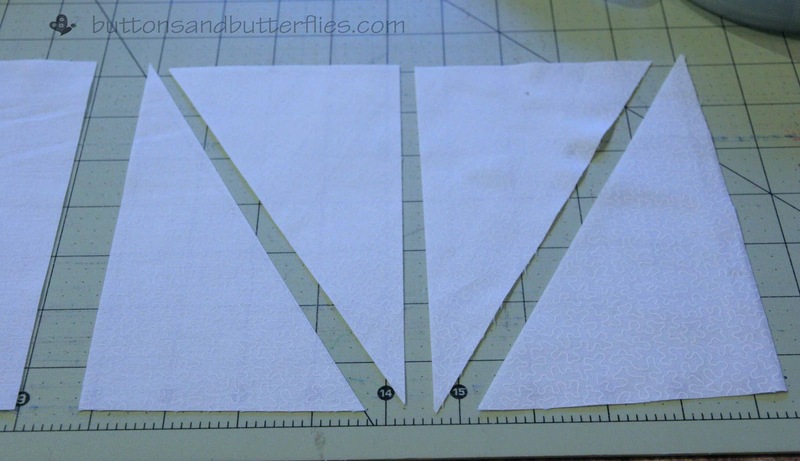 This time saving the half triangle ends and cutting the center if the equilateral triangle. Piece the four triangles to the corners of the hexagon. At this point you simply trim to make your 12.5 inch block. I was VERY Wicked and didn't take a picture of the block all alone at this point because I was anxious to get it ready for the pillow! 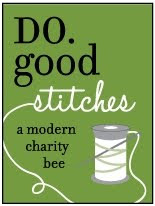 Now that you have checked out my Wicked post....Go make sure you check out the rest of the blog hop participants today!! It has to be pretty wicked scary today considering it is HALLOWEEN!!!! And if you missed the other days...just click on the Wicked Image at the top of this post or in my sidebar. There are AMAZING projects going on out there! 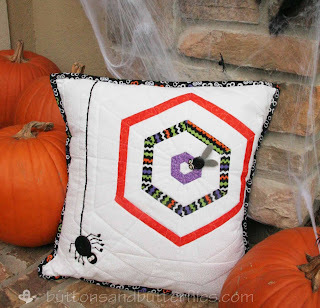 Wow great pillow - I love your fly and spider made from buttons and thank you for the great tutorial - I have one of those cutting rulers and have never cut angles on it and so didnt know that was how you lined them up so I have learnt that today too! might have a play later to check it out! Thanks for sharing. I have always wanted to make a spiderweb block but have to say that this design has appealed to me the most. I've gotta make one. SO appreciate the tutorial! Brilliant, I love it and thank you for the tutorial. Absolutely LOVE your itsy bitsy spider web pillow. Makes me want to make one too. I love your cushion! and the addition of a spider is just perfect! 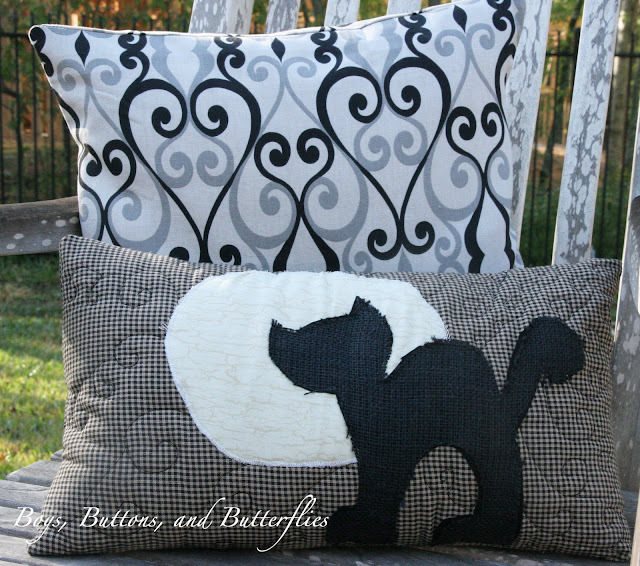 Awesome pillow Heidi , love all the details and thanks for the tutorial , this would be fun to make. Your pillow is beautiful and thanks for the tutorial !@! That is just too fun!! Love the fly and the spider!!! 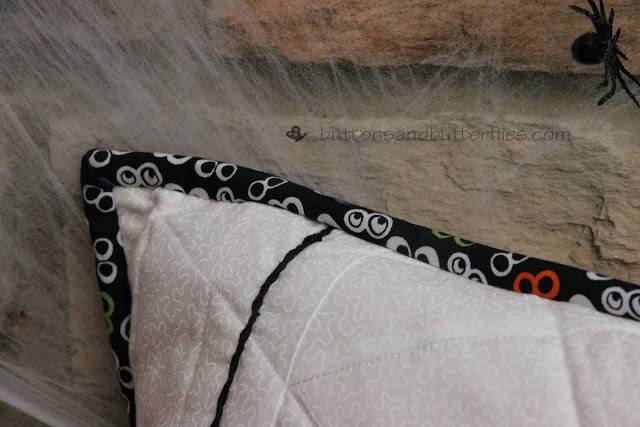 Thanks for a great tut for a fabulously wicked pillow! Your pillow is awesome.Thanks for the tutorial!! Love your pillow.. Great idea with it. What a great post!! Love your pillow and the tutorial was great. Thanks for sharing all the pics with us. I'm completely fascinated with what you did with those buttons LOL. The fly and the spider..they just amazed me!! 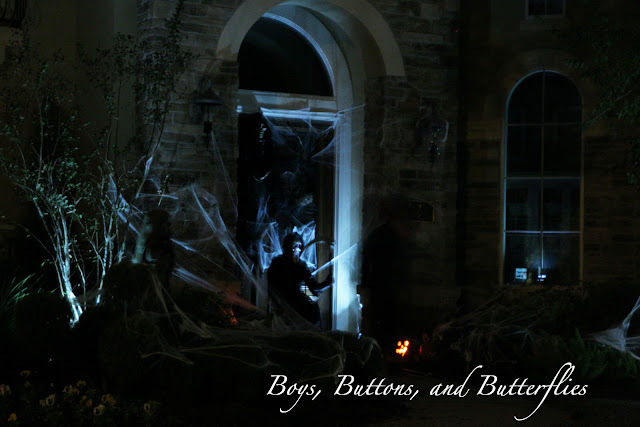 Absolutely love your button bugs...happy Halloween! Why did I think of the old movie "The Fly" when I saw your cute pillow? I guess because so many have talked of the movie "the Birds". I can just hear that little fly screaming! 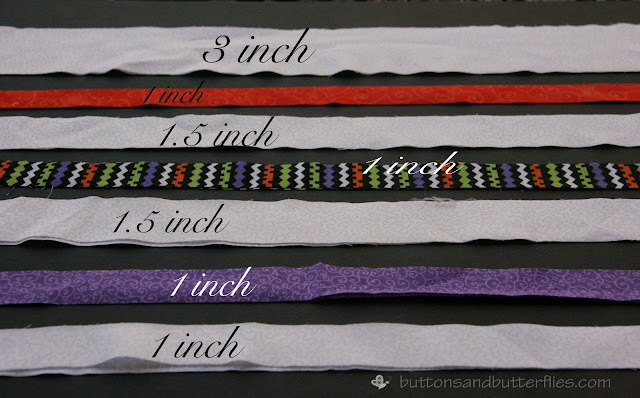 So cute that I think I'm going to make a pin cushion with this idea! What a fun pillow, and I also like your cat pillow from last year. Happy Halloween! What a pretty spider web and spider! I love it! I also love what you did with the pillow binding! Perfect! Super project, great instructions, and the button fly and spider are spooktacular!! Thanks for the great tutorial! Spiders I actually LOVE. Thanks for all this wickedness! Heidi, it is so cute! I love that the fly and spider are made out of buttons!! 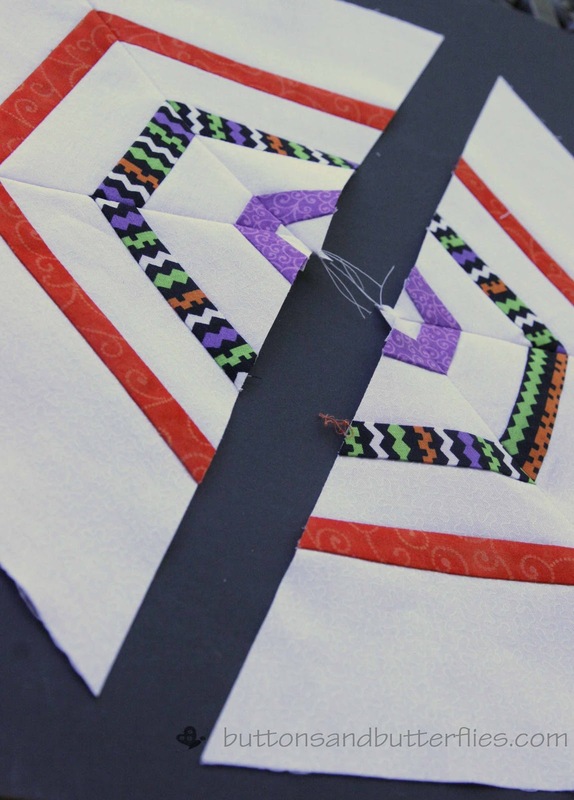 Love your wonderfully wicked spider web block! That button spider is darling! Thanks for the tutorial! Such a great wicked pillow. Thanks for showing how to make it too. Now this is a spider and fly combo I wouldn't SQUISH! Does it get any cuter than this pillow? No, no it does not!! Thank you scads for the tutorial. I'll just bet there's going to be quite a few of these pop up all over the place! Hi!!! I love the fly and spider!!! Thanks for the tute!!! 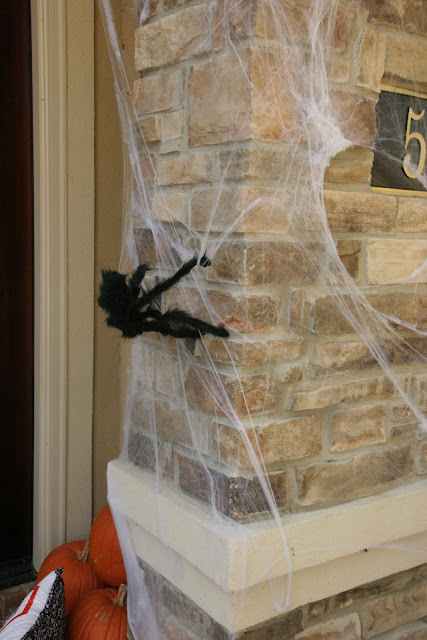 Your house is decorated wickedly cute!!! Thanks for all the fun!!! 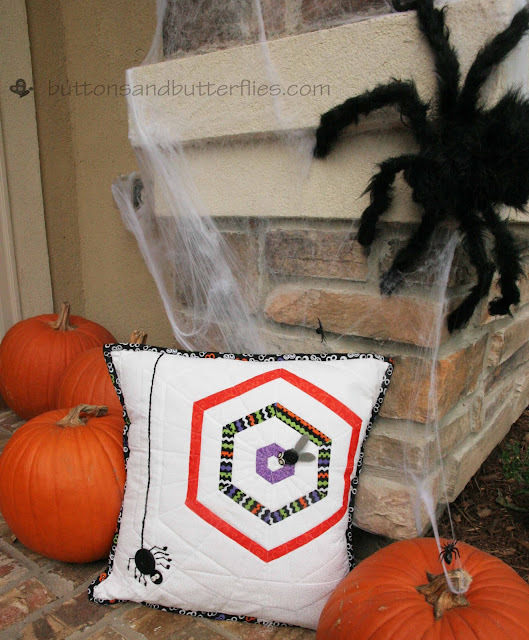 How wickedly cute is this pillow, your button spider and fly.... what a great design! Thanks for sharing this lovely post with us. Wow...It all looks so Great! I love your theme and decorations. I especially like the spider made with the button. Thanks for sharing all with us. Happy Halloween! What a great post. The spiders are so creepy! Thank you for the tutorial, I would love to try it. BUT, the wolf howling at the moon, just amazing! Happy Halloween! 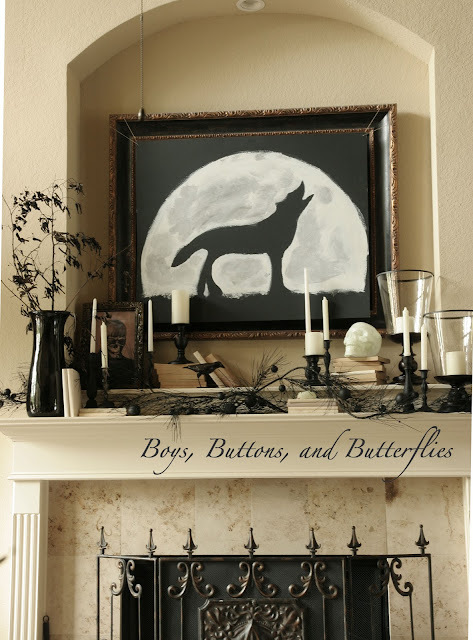 How adorable and creepy at same time, thanks for tutorial I pinned it for next year.Thanks for showing us your other Halloween things, loved the wolf howling over fireplace. Happy Halloween! Love the pillow. Great tute, and great choice of fabric! Thanks for sharing. Beautiful pillow. Thank you for the tutorial. I will have to make that one too! And: Don't worry. My stuff talks to me all the time too! What a wicked great pillow. I love the button bugs. Your spiderweb pillow is fantastic! Love the fly in the middle and the hungry spider waiting for its dinner. Thank you for the great tutorial. What a great block! Thanks for the tutorial, and for sharing with us all. 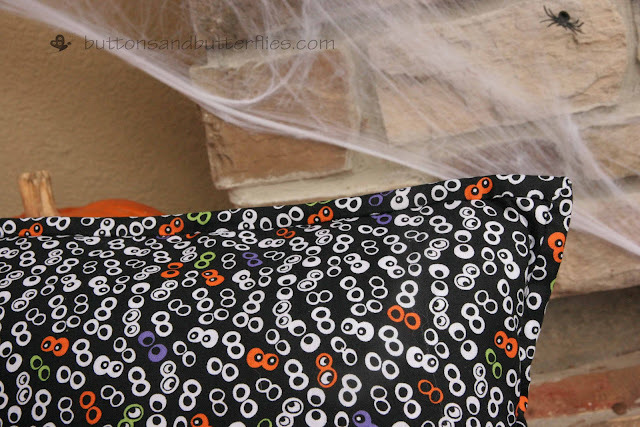 That is an absolutely adorable pillow with the button critters. I really like your idea for the pillow. Thanks for sharing. Thanks for being in the hop. Oooooo, I loved the wicked spider block/pillow. Thanks for the tutorial! Wicked work thanks for sharing!! Super!! Great block and I loved what you did with it. The creepy crawlies are adorable, if I say so myself! Thanks for the tut and for sharing with us. Happy Halloween. What a great pillow. The fly and the spider are very cute additions. Binding on a pillowed cover sounds like a very useful idea. What a great pillow! 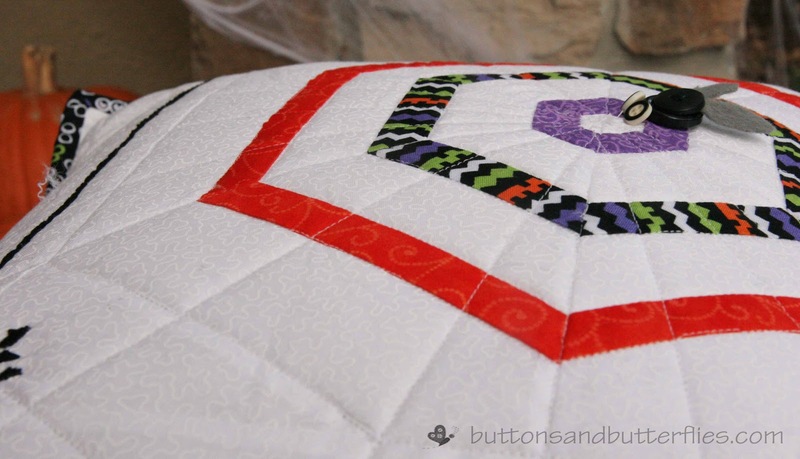 I just love the spider and fly made from buttons! Thanks for the tutorial. I'll be making one of these for next year. Thanks for the great tutorial on that darling block! What a great tutorial! thanks Heidi! Great tutorial! Love what you did! Great tut. I love the spider and fly made from buttons. Thanks for sharing. 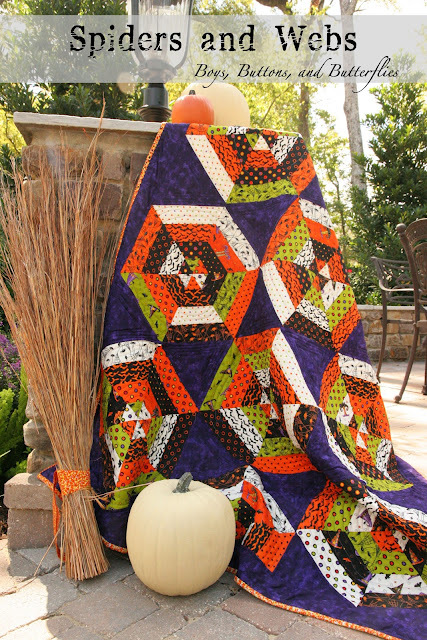 I have admired your spider web quilt for awhile. The pillow is so Wickedly awesome! Thanks for the tutorial! I love the pillow! It is wickedly fun. LOVE LOVE LOVE this block! Thanks for sharing and for the tutorial.